Lori Goldstein, stylist to the stars and one of the great names in the fashion industry (having worked on countless editorials for magazines like W and Vogue Italia), was more than kind enough to send me this cardigan from her LOGO Instant Chic line for QVC. I love the quirky little details from the pleated ruffles, to the sheer chiffon back & the loose fit. I think the biggest plus though is how easily this piece acts as a pop of color to a mostly blah-colored ensemble. Boom. Awesome. You can get more of Logo via facebook or twitter! I love this outfit. The gingham shirt if so cute. guapa!guapisima! !y que pasada tu collar!! which js heels are those? i wanna see more! that cardigan gives such a pop of colour! it's totally un-expected. I love this outfit. The purple compliments your hair so nicely! the purple goes so well with you hair! that purple! those shoes!!! incredible. found you off chictopia, had to comment on the blog how much i love this outfit! so striking, your colour combination is amazing!!!!! now i want to be a redhead haha. loving this outfit and your blog- now a follower! 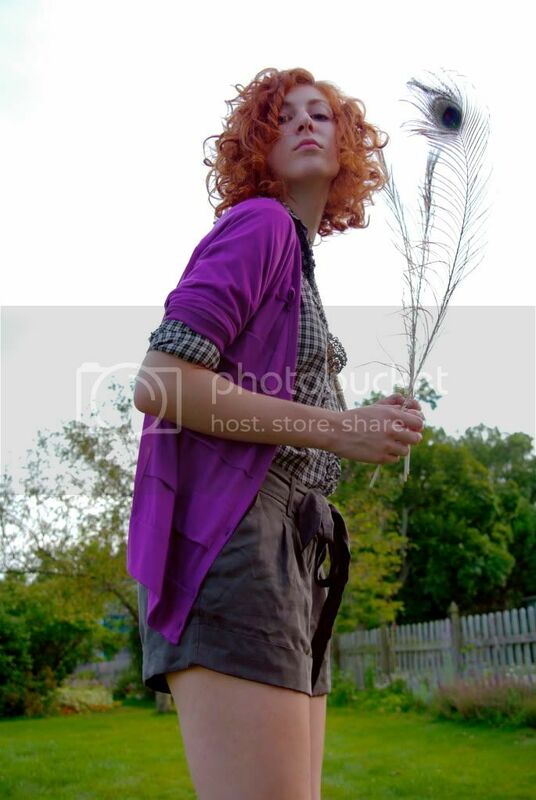 I adore all the colors in this shoot--the purple sweater, your red hair, the random peacock feathers. I love your outfit!!! The necklaces are so chic! I absolutely adore this outfit...I am seriously drooling over that cardigan...and those shorts... and shoes...ok everything!!! Thanks for the lovely comment. I love your hair with that purple. Such a perfect contrast!